Reviewed book edition with pictures of Asia blog. I would like to dedicate this page for projects, which I developed. I prefer to put here only bigger projects so don’t be surprised that this page contains only two projects just now. I made this project during my second year of study the university as a work to project’s seminar. The main aim was to create game similar to chess, but some rules are different and some rules are added. Program was developed in C#, in Visual Studio .NET. If you are interested in the game, You can download ZIP version, where you can find not only the executable game, but also a documentation for the program, which we gave together with the program to the teacher at the end of the semester. Caution! The program is executable only on computer, where .NET Framework is installed. I created this project as my Bachelor's work. The project is a team work with my colleague Premek. I decided to make a different work then other (such as editors etc.). I wanted to realize a tension strategy, which I devised when I was 15. 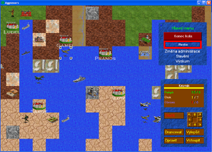 You can play the game with computer players, with other player on the same computer or via Internet or intranet. The program uses as input and output XML format. If you are interested in this game, you can download the game with complete documentation (you can find there not only programmer's documentation, but also game instruction and user manual). Program was developed in C# in Visual Studio .NET. It is still in progress. Caution! Program is executable only on computer, where .NET Framework 1.1 or higher is installed.